101107 - Up and all to church. Then home for lunch. G was really grumpy so he took an early nap. DJ&I built some stuff out of scraps and did some science experiments. 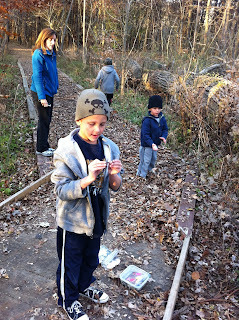 When G finally woke up we all went on a hike at a local park and found the geocache that my cousin Jen had put out. Then LD&J went to the church Christmas show practice. G&I back home and the Barnette boys came down to help run some electric for the new dryer. L brought food home for dinner and then we played the Wii until bed time.